Most of us begin our gardening season by planting some of our vegetable seeds indoors. However, it can often be a very frustrating experience. When I was first learning how to garden, I can’t tell you how many times my poor seedlings failed to grow at all, or became extremely tall and leggy and weak. Sometimes they died suddenly in their containers, while others died shortly after being planted outside. First of all, it’s important to use strong and vigorous seed. Old or poor quality seeds often fail to germinate well, take longer to grow, and may produce weak seedlings. Don’t start your seeds too soon! Holding your plants for too long in containers while waiting for the weather to warm up can cause your plants to become root bound. They may never recover and grow well when finally planted in the garden. It’s often better for them to be planted a couple of weeks later than normal in the spring than it is to start them too early. Johnny’s Seed Starting Date Calculator is a great tool to help determine your best starting dates. Use good quality seed starting soil mix. There are excellent mixes available from Johnny’s Selected Seeds, Gardener’s Supply Company, Peaceful Valley, and other companies. Most potting soils are very dry when you purchase them. It's extremely important to thoroughly moisten the soil BEFORE you put it into containers for planting. It takes a lot more water, effort and time to properly re-moisten the soil than you might realize, as dry peat moss strongly repels water. Put the dry potting mix into a large bucket, dishpan, tray or other container that will give you plenty of room to mix and turn the soil over as you add water to it. It should feel like a moist, rung-out sponge when it's ready. Your local garden centers often carry a sterile soil mix made of peat moss or coir, with vermiculite or perlite – but no compost or fertilizer. This sometimes has a small amount of lime added, if peat moss is the main ingredient. But these mixes often don’t include any fertilizers, so you’ll need to either add a fertilizer blend to it, or start using a liquid fertilizer (half strength) once a week to provide nutrients to your young plants as soon as they start forming true leaves. However, most organic liquid fertilizers are fish-based, and I don’t particularly like the smell of that inside my home. Make sure that your compost is fully mature and not contaminated with herbicides (read Don’t Kill Your Garden with Compost). Immature (unfinished) compost may contain compounds that will damage your seedlings or prevent seeds from germinating well. If you use vermicompost (earthworm castings), limit it to 10% of the soil mix (9 parts mix with 1 part vermicompost). You can choose among many different types of containers to start your plants. I suggest that you grow your seedlings in larger pots than nurseries usually use. (Read One Way to Increase Yields up to 50%) I prefer to use 3” wide by 4″ tall (7.5 cm) containers for most vegetables, but 4” wide (10 cm) containers for tomatoes, squash, and other large vegetables. But if you don't have room to use larger pots, you can still successfully grow seedlings in smaller ones – just plant them a little earlier, before they become root bound. All these tomatoes were started at the same time, but the ones growing in the larger pots are nearly twice as large. You can also use 8 ounce (.24 liter) paper cups, if you punch drainage holes in the bottom. I don’t generally recommend using peat pellets or peat pots, nor growing plants in tiny “cute” eggshells. Fill containers to about ¼” (.6 cm) below the rim of the container, and gently firm the soil. If the surface of the soil is too far below the rim, the young seedlings will have poor air circulation and may be more susceptible to fungal disease. 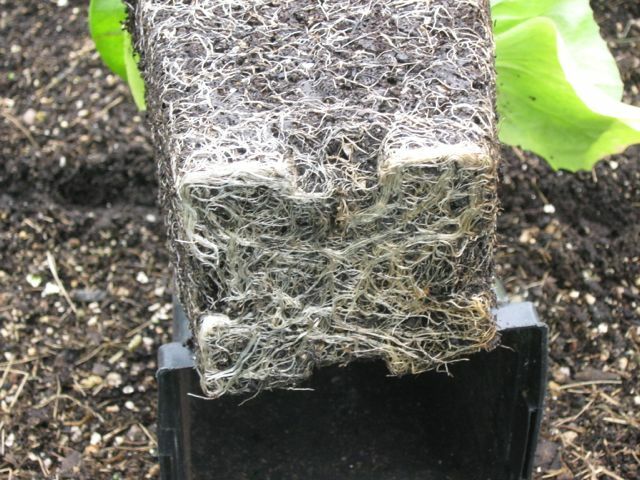 To reduce problems with fungal disease (damping off), some people cover the seeds with vermiculite or shredded sphagnum moss (not peat moss) instead of the potting soil. If seeds are too crowded, they will become leggy very quickly in their effort to outgrow their neighbors as quickly as possible. I usually plant 2-3 small seeds (or 1-2 large seeds) in each pot, and I space each seed in the pot at least ½-1” (1-2.5 cm) apart. As soon as the plants start touching each other as they grow, I keep the most vigorous healthy seedling, and cut the others down to soil level (don’t pull them out, which can damage the roots of the remaining plant). Be sure to give each plant enough elbow room to grow. These larger plants will need to be transplanted sooner than the smaller ones. Provide enough warmth for your seeds to germinate quickly. Cool-season crops like lettuce and cabbage usually germinate fastest at around 70 F (21 C), while warm-season crops like tomatoes and peppers prefer closer to 80 F (27 C). Most seeds will still germinate at lower temperatures, but they may take much longer to do so (such as 10 days instead of 4 days) and they may be more susceptible to fungal disease during that period. Use heat mats under the seeds, if necessary, to provide extra warmth in cool rooms. In this case, most people start the seeds in small flats on the heat mats, and then transplant the young seedlings into larger containers once they start growing their true leaves. If I’m not using heat mats, and I’m using a light stand with two levels of lights, I’ll put my newly-planted seeds under the top lights, where they’ll get some extra heat rising from the lights below. Most seedlings will grow better at slightly lower temps than what they prefer to germinate at, so don’t keep them too hot after they’ve sprouted. Keep the soil moist, but not soggy wet. I don’t recommend growing seedlings in windows. While some people are successful at it, windows have cold drafts and often don’t provide bright enough light for enough hours of the day to produce strong seedlings. Instead, I strongly recommend growing your plants under long T8 florescent bulbs, which are brighter and more efficient than the old T12 bulbs. I’ve had problems with the cheapest brand of shop lights used to hold the bulbs, and now prefer to purchase the medium-quality shop lights, which are usually about $20. Any commonly-available type of florescent light bulbs (warm or cool, but not compact) can grow good seedlings, but bulbs more than 2 years old might not provide enough light. Keep your seedlings only 1-3” (2.5-7.5 cm) directly underneath the lights, and provide 14-16 hours of light every day – but not 24 hours! Seedlings need darkness during the night. Using a timer makes this easy. Light stands are often expensive, but it can be cheap and easy to create your own. Here’s directions, with a video, on how to create a light stand out of inexpensive PVC that can be taken apart and put away when not needed. Once your seedlings reach 2” (5 cm) high, lightly brush the young plants with your hand (10 times, once a day), to encourage stocky growth. Plants grown indoors are not used to sudden temperature changes, wind, or direct sunlight. If you don’t “harden them off” before putting them into the garden, they can become sunburned or experience shock from the drastic change – sometimes badly enough to kill the plants. Start hardening off your plants about one week before the seedlings will be ready to be transplanted into your garden. This process involves gradually exposing your plants to more sunlight, wind, and temperature changes. The simplest way I’ve found to do it is to protect the seedlings with heavy row cover on hoops for the first day or two. Then I open the row cover on the east side during the day just enough to allow the plants to receive 2-3 hours of direct early morning sunlight, but still be protected from most wind. I fully cover them again during the night. After a couple more days, I open the row cover enough to expose them for ½ day. After a couple more days, I open it even more. After one week of this process, they have adjusted pretty well to being outdoors, and are ready to be planted into the garden. Sometimes I follow this process with new transplants put directly into the garden bed, instead of hardening them off in their pots first. When I sold heirloom tomato plants, I hardened them off under row cover, gradually exposed them to more sunlight and wind each day or two. Don’t wait too long to transplant your young plants into your garden! Even delaying just 7-10 days past the ideal time can be enough to cause the plants to become root bound and stunted. Most plants are ready to be planted when they have at least four adult leaves, and their roots fill the pot just enough to hold the soil together – but before the roots start wrapping around the inside of the containers. This transplant is ready for the garden. The roots are holding the soil together, and it has four adult leaves. This plant should have been planted a week or two ago. It is heavily root bound, and won't grow well in the garden. By following these simple tips, you can grow strong and vigorous transplants for your garden. Vigorous vegetable seedlings will grow quickly, produce more food, and may be more resistant to pests and diseases. Thanks for the perfectly timed info. With these tips, maybe I can finally have some good success in indoor seed planting. My results are generally very marginal, but I see many ways to improve my endeavors from this valuable article. Can’t wait to get started! Best wishes on your seed starting this year, Debra! Hi Heather! I know that some people say that transplanting the seedlings multiple times like you have done can help to form bushier root systems on the plants. Frankly, I’ve found it to be just too much work, and I’m able to grow very vigorous seedlings from planting the seeds directly into a large pot instead. The one time that I think it would be useful to start seeds in a seedling tray and then transplant them into larger containers would be if you needed to germinate the seeds in a small tray that can fit on a heating mat and, as a result, you have limited space to get them started. You can always experiment with both methods and compare the labor versus how well the plants end up growing. Let me know how it goes for you this year. Some good tips…thank you. Last year I tried something I had never tried before and had very good success with most, but not all my plants. I used Gurneys seed stsrting kit which uses soilless grow plugs which sit in a styrofoam cradle which sits in a water tray and has a dome. My lettuce and tomatoes and peppers and eggplant all did quite well, but my cucumbers and squash and watermelon and others not so well. 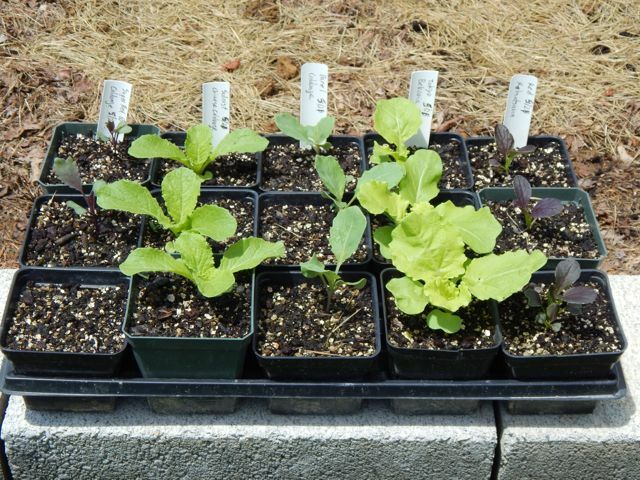 I think fron your articles I will try growing certain things in the 3-4″ containers this time and also some things you said to grow from direct sowing in the garden. Have you ever used the grow plugs? What are your thoughts? Hi James! I used small grow plugs years ago. They can be a great way to get some seeds started, but it’s very easy for the seedlings to become root bound, unless you transplant them into larger containers very early in the process. The cukes, squash, and watermelon plants don’t really like being transplanted, though it’s possible. They develop very large root systems extremely quickly, and they hate having their roots disturbed. If I was going to try transplanting them, I’d start them in 4″ containers, transplant them when they are only 2-3 weeks old, and try avoiding disturbing their roots when planting them. I usually just direct seed them into my garden, though I might transplant them if I had a very short growing season or a tight schedule with succession plantings. Best wishes with your garden this year! I noticed in this article that you do not recommend peat pots. I transplanted some seedlings into peat pots before I read this article. Should I plant the seedlings in the garden in the peat pots or take them out of the pot before planting. What is your opinion on planting by the moon. Do you think it makes a worth while difference. Thanks so much for your valuable articles. Hi Marcia! I have never gardened by the moon, but I get great harvests despite that. I also don’t follow most companion planting recommendations for vegetables, and my plants grow just fine. Those are two things I don’t generally worry about when I plan my garden. As for peat pots, I don’t use them and I’ve heard from other gardeners that haven’t had good luck with them – but others do like them. I probably wouldn’t bother taking them out of the pot when planting – BUT I would make sure that no part of the pot was sticking up out of the soil. I would tear off the dry upper part of the pot before planting, and then just bury the rest. Best wishes! I really enjoyed this article. Picked up several good points especially about the grow lights. Bet my current lights are 5 years old. How can I measure their output? A few years ago while doing my fall cleanup I pulled up some plants that I had started in the small peat bags (about the size of a quarter/swell up to about the size of a golf ball) and saw very few roots had grown thru. I no longer use those and will take your advice and discontinue use of peat pots. Hi Ronj! You’re very welcome. Thanks sharing your experience with using peat pellets. As for your older lights, I know that we can’t visually see the difference with older bulbs, because our own eyes adjust to different levels of light. You could compare newer bulbs with older bulbs by using a light meter (used for photography). But it’s often easier to just buy new bulbs. You’re very welcome, Holly! Thank you for your kind words. Best wishes with your garden! Thank you, very thorough and helpful. After reading your article I rushed to my garage and sorted out all the little plastic pots I had kept from previous nursery-bought plants accumulated over the years, dozens of them, and kept only the bigger ones. I was very interested as well in learning of the importance of warmth, much higher than I would have imagined, and light. Thank you for a very helpful article . Such a helpful post. Thank you. I have to admit I had never thought about the vigor of some of the old seeds I plant. I have some tomato seeds that are about three years old. I should probably consider buying new ones. And I’m wondering about the root bound tomato plant you show above. Would it grow any better if those snarled roots on the bottom were sliced off? I’ve done that with some transplants that looked similar. They did grew, but I’m not sure if ‘root pruning’ really helped them. Hi Bill! Tomato seeds tend to hold up better in storage than most other vegetable seeds. If they were stored in the fridge or in a cool dry room, they’re probably OK. Onions and parsnips, forget it. They are very short lived seeds. As for the snarled roots, I tend to cut them off before planting. But some vegetables may experience severe shock with that kind of treatment (such as peas, beets, melons, squash, etc). Tomatoes tend to be more resilient, and bounce back better. If broccoli transplants get badly root bound, I won’t even plant them at all. They simply won’t produce a good head after that. It’s a waste of my time and garden space to even try. Best of luck with your garden! I started herb and veggie seeds of all types for the first time this year. Some, but not all, grew well. I know now that my mistakes were starting way too early and not providing near enough light and will plan better next season. All of my seeds sprouted but many became weak with bent and leggy stems. They never grew true leaves then they died. I have a question about the number of seeds in a pot. Should you always put a max of 3, even with tiny herb seeds? Also, does 1 seed yield 1 single plant, or do some grow into clumps? I didn’t know if 1 single seed would produce, say, a large oregano that fills its pot or if I would need multiple seeds. I feel silly not knowing these simple things, but I haven’t found a good book that explains all that yet. Any input is very appreciated! Thanks for a wonderful article! Hi Amanda! Most seeds produce one plant per seed. I usually plant 2-3 seeds per container, spaced slightly apart, and then thin them down to the most vigorous plant when they start growing. If you’re not sure of the quality of your seeds, you might want to plant extra seeds – though it’s too easy to overcrowd containers. Other gardeners choose to plant just one seed per container, but plant extra containers – because not all seeds will sprout and not all seedlings will grow strong and vigorously. However, Swiss chard and beet “seeds” are actually clusters of seeds, and will produce multiple plants. Hope that helps! Some seeds require light to germinate, and won’t sprout if they are covered too deeply with soil.